Title: Alive! 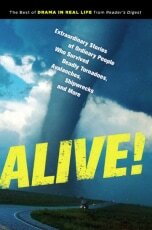 : Extraordinary Stories of Ordinary People Who Survived Deadly Tornadoes, Avalanches, Shipwrecks and More! The stories in Alive! highlight life-and-death moments where the will to survive is the only thing that keeps one hanging on when hope seems lost. In “The Tot and the Twister,” Derek Burnett tells the dramatic story of a grandmother’s determination to protect three children when a tornado rips through her house. In “Terror on the Cliff,” Kenneth Miller recounts hiker Larry Bishop’s harrowing forty-eight hours clinging to the side of a mountain, thoughts of his wife and daughter giving him the courage to await help. And in “Face to Face with a Grizzly,” Kathy Cook describes how two women who are being mauled by a bear summon all of their strength to defy death. A captivating collection at once gripping and inspiring, Alive! will keep you on the edge of your seat and remind you how ordinary people can do extraordinary things in extreme circumstances. I knew when I read the description of the book, Alive! that it was one that I wanted to read. I read the news websites on a daily basis and many times the stories are depressing. Alive! is the stories of survivors. These are people who have suffered unimaginable odds and lived to tell about it. I read the book in a matter of two nights. It was engrossing to say the least! The stories are short and are grouped into sections. For example, section one, titled Facing Mother Nature’s Fury, tells real-life accounts of people who lived through tornadoes, landslides, shipwrecks, firestorms and more. I was tense reading the stories about the twisters. I have been having recurring nightmares for over 10 years about tornadoes. And no I’ve never been in one either! The second section is called Courting Disaster and features stories of adventure seekers who had some bad luck while on their journey. I’m not the adventurous type and you’ll never hear me say I’m going to climb a mountain or trek across the South Pole. It was something to see how brave these individuals were and how they survived under such brutal conditions. In The Wrong Place at the Wrong Time, I read about a jet crash in the jungle and a little girl trapped under a 10,000 lb boulder in the mountains. The last section is called At the Mercy of a Wild Animal where I read about attacks of yellowjackets, a shark, mountain lion and bears. After reading about Shannon Parker’s attack by a mountain lion in California, I had to google her story. I watched her interview on Larry King and was amazed that she was alive! It was a brutal attack and she was very lucky. I don’t know what I’d do if I ever found myself face to face with a wild animal like that. The stories with the bears hit close to home. Recently in Canada, a woman was killed by a bear in Alberta in a predatory attack. I was reading the news and thinking how awful and imaginable it was. It just made me really appreciate the here and now and be thankful for what I have. Even though all these real-life accounts in Alive! are harrowing to read, they are also inspiring and proof to me that miracles do happen. I’d love to read this book! Love a good nail biter…also love that the stories are of SURVIVORS. Very gripping and compelling. I like that they group and categorize them. I was worried about being overloaded with detail and imagery, but this sounds like a gripping read. For me, the tornados would be real due to living in midwest. Adding this to my booklist! This looks like an interesting collection of stories. It’s not something that I would read but it does look very interesting. Thank you for sharing this review. I enjoy reading this type of story in Reader’s Digest, so I know I’d enjoy this book. It’s incredible how some people survive against all odds. This sounds really fascinating and really terrifying at the same time! At least these people survived their ordeals! I love survival stories ~ this sounds like an intense book. Thank you for sharing your review. This sounds like a great pick you up book. I’m with you the news seems to be depressing. I these types of stories just raise my blood pressure and heart rate. I think I’ll pass. Wow, this seems like an edge of your seat kinda book! Sounds really good!! I am happy to be living in a non-tornado state because tornados scare me like no other natural disaster. Sounds like a great book, thanks for the review. I believe that I would enjoy this book because it is full of stories of survivors and people who overcame the odds. Thanks for the review. I used to live in the south and the town I lived in was very prone to bad tornadoes. So scary, and so violent. This would be a great story of survival. Thanks for sharing this book review with your readers. Sounds like an electrifying read and one that I know I would like. Thanks again Stacie.